Come July those lovely dragonflies with the blue dusted abdomens are on the wing here. They are the Skimmers Orthetrum spp and we have four species recorded for départements 36, 37 and 86, plus two similar looking Chasers Libellula spp. Only the adult males have the pruinose dusting that makes them go blue. Females and tenerals (juveniles) are yellow with black scallops down each side (don't mistake them for Clubtails, which apparently often happens if you are a beginner). 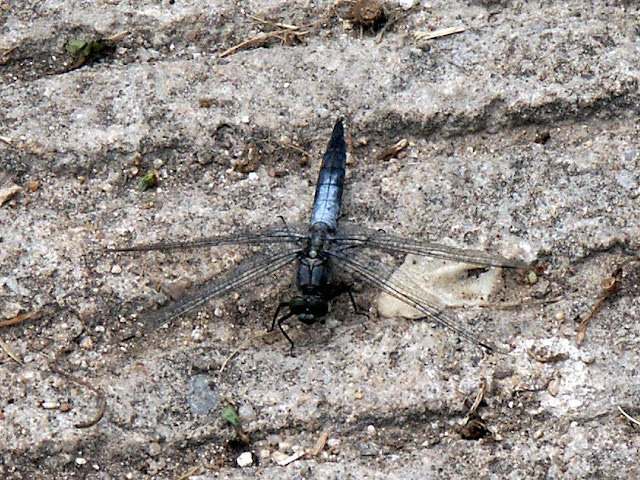 Black-tailed Skimmer (mature male), photographed on the boat ramp in Preuilly. Black-tailed Skimmer O. cancellatum: This is the skimmer you are most likely to see, between May and September, peaking in June and July. 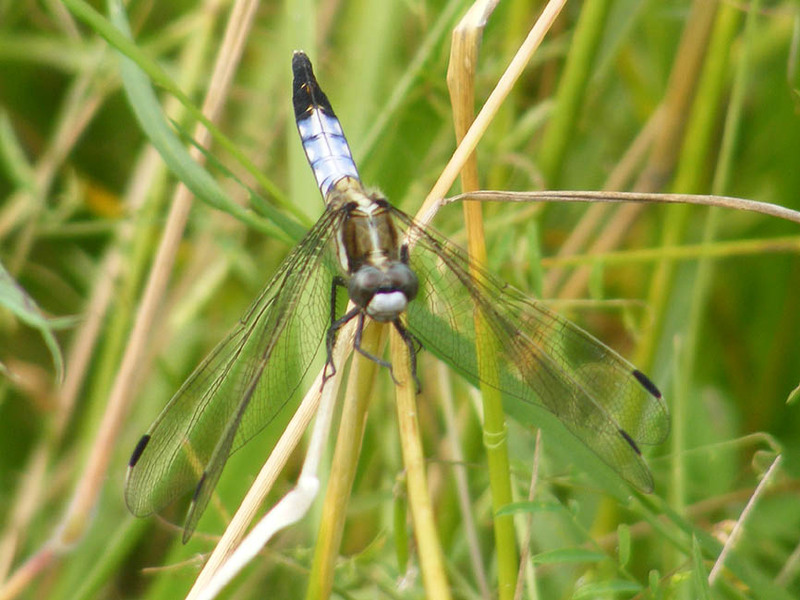 It has clear wing bases (distinguishing it from the Blue Chaser) and black pterostigmas (the coloured cell on the wing near the tips). The thorax does not have pale stripes and the appendages (tip of the abdomen) are black. My observation is that this species is most often seen close to larger watercourses like rivers and canals, usually sunning themselves on bare ground or zipping about defending their territory. White-tailed Skimmer (mature male), photographed on one of my Boussay butterfly transects. A mature female photographed near the Maison du Parc in the Brenne can be seen here. White-tailed Skimmer O. albistylum: Always a less common species, but by no means rare, flying between May and September, peaking in July. They have clear wing bases and black pterostigmas like the Black-tailed, but can fairly easily be distinguished from that species by the pale stripe running down the middle of the thorax, from the back of the head and between the wings, and pale bands on the side of the thorax. The appendages at the tip of the abdomen are white. My observation is that they are most often found in rank grassland, often a long way from any watercourse or étang. Keeled Skimmer (juvenile male) photographed in our potager. His abdomen will develop the blue dusting within days. 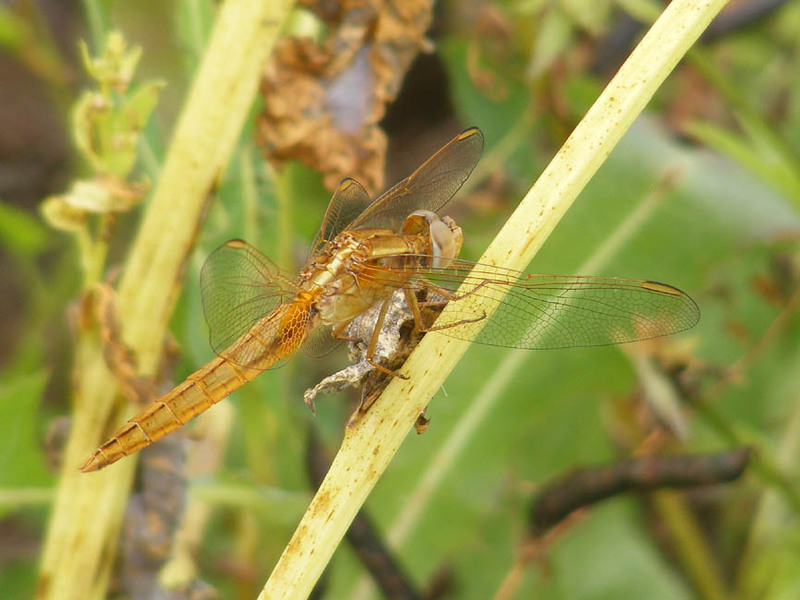 Keeled Skimmer O. coerulescens: Smaller than the above two species (more the size of a Common Darter) and much more localised in distribution. They have long yellow pterostigmas and pale thorax stripes. When mature they have only the finest black lines and dots on the abdomen. Like the White-tailed, my observation is that this species is found in rank grassland away from water. They fly from June to September, peaking in July. 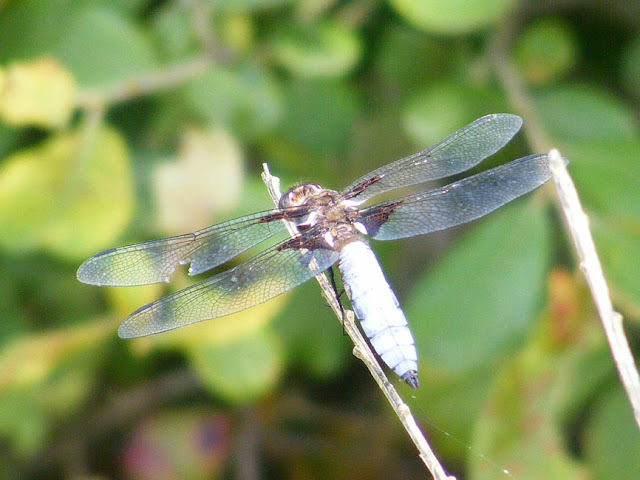 The fourth species it would be possible to see here is the Southern Skimmer O. brunneum, which looks like a large, late flying version of the Keeled. They are very localised and uncommon. Amongst all these slender 'blue arrows' you will also find the big bruiser Broad-bodied Chasers Libellula depressa, abundant and often dominating the étangs. They have much broader abdomens and black wing bases, so are not too difficult to distinguish from the Skimmers. What beauties, Susan. And fabulous photographs! Great pix Susan... and informative article... comme d'habitude! Thank you both -- you are very kind! Pretty. the big ones seem less hyperactive than the damselflies. I just keep getting pictures of grass where they used to be. Très intéressante présentation de ces libellules qui présentent des aspects semblables. Mais chaque fois bien des détails nous orientent vers la bonne détermination. 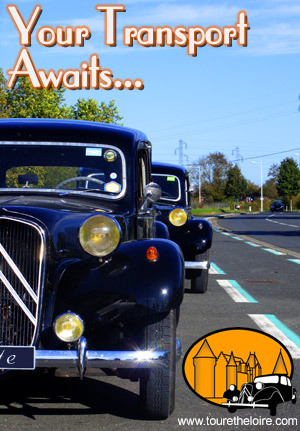 Je ne vois que très rarement O albistylum! Lucie: O. albistylum is definitely not as common as O. cancellatum here either. It's not rare, but not ubiquitous either, like O. cancellatum is.